Heart-shaped Box (2016) features home video footage of the artist, taken in 1995, at the age of 3, just four years after her family had immigrated to Canada. As they settled into their daily lives in their new home, grunge music was at the height of its popularity. 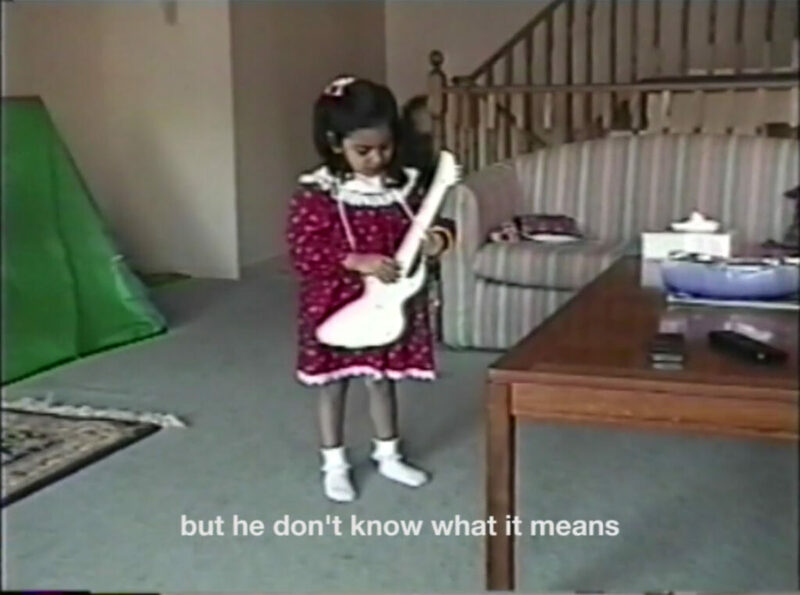 Naqvi’s sisters were particularly taken by bands such as Nirvana, Live and Hole and in this home movie, Naqvi’s sisters teach their youngest sister to sing the lyrics to some of the era’s biggest hits. Grunge music emerged in the American-northwest, in the post-punk era of the mid-1980s. It was primarily popularized by lower-middle class white Americans, who felt that they were on the margins of society. The lyrics in grunge music were typically angst-filled, and often addressed themes such as social alienation, apathy, confinement and a desire for freedom. Naqvi’s Heart-shaped Box provides a different take on this narrative. Here, the music resonates with newly immigrated Pakistani teenage girls. Naqvi’s sisters were on the outside of a new society aiming to fit in. This video is an example American popular culture influencing a generation of people for whom their product was unintended yet with whom it resonated honestly. Zinnia Naqvi is a visual artist based in Toronto and Montreal. Her work uses a combination of photography, video, writings, archival footage and installation. Naqvi’s practice often questions the relationship between authenticity and narrative, while dealing with larger themes of post-colonialism, cultural translation, language, and gender. Naqvi received a BFA in Photography from Ryerson University, and is an MFA Candidate in Studio Arts from Concordia University.